Budget economy braided BLACK genuine leather, with a reinforced handle and wrist strap. 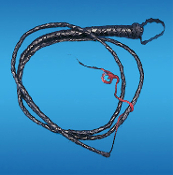 This bull whip makes the perfect cosplay Halloween prop accessory to any cowboy, horseback rider, or cosplay action adventure costume! Originally used as an implement for severe physical punishment. Fetish master slave prisoner dungeon torture room weapon cosplay Halloween costume accessory. SNAP THIS BULL WHIP LOUD!!! Handmade, so length may vary… usually longer than 6-feet. Red Cracker on End Of Whip. Approx. Over 6-feet (180cm) total length, without wrist strap. Handle: approx. 9-inch (22.5cm) long. *Warning: This is intended as a costume accessory only, and should never be used as an actual weapon!